Odion Ighalo is a popular Nigerian professional footballer who plays for English club Watford and the Nigeria national team as a striker. Born in Lagos, His career began in a football club named Prime. In 2006, the footballer left this team and moved to another one named Julius Berger where he was discovered by FIFA agent Marcelo Houseman who recommended him to Atta Aneke, being subsequently taken on trial by Norway’s Lyn Fotball. He made his Tippeligaen debut on 16 September 2007 at the age of just 18, scoring in a 2–0 home win against Viking FK. He netted six goals in 13 games in his second year to help his team to the seventh position, and subsequently arose interest from other clubs in the country, with SK Brann reporting Lyn to the Football Association of Norway for unfairness in the negotiation process. He is quite not from a silver spoon family, Odion is the kind of player who hustled a lot to reach where he is. “Life in Ajegunle was tough, we had no idea what the future would hold but we would wake up every morning content with the opportunity of another day,” the Watford striker said. “I’m the youngest [with twin sister Julieta] in a family of seven kids. We hoped for a better life. We would stand by the canal, look across it and pray for a miracle that will take us out of the ghetto. “The little house we lived in was built by my father and he made sure we didn’t starve like other kids. “You didn’t need extra motivation to succeed when you are born into the hardship and struggles of the ghetto. Read ALSO: Another Nationwide Annular Eclipse To Hit Nigeria Very Soon! See Details. On 30 July 2008 Ighalo signed for Udinese Calcio in Italy, moving alongside teammate Jo Inge Berget and agreeing to a five-year contract. He appeared rarely in Serie A in his debut season, scoring against Cagliari Calcio in a 6–2 home routing – four of his five league appearances came as a late substitute. Ighalo was loaned to Granada CF in the 2009 summer, as part of the partnership agreement between Udinese and the Spaniards. He scored 17 times in his first year (playoffs included) and five in the second, as both seasons ended in promotion; this was interspersed with a brief loan stint back in Italy with A.C. Cesena. Ighalo joined Watford on a season-long loan deal from Udinese, on 29 July 2014. He made his debut for the English in the first round of the Football League Cup at Stevenage on 12 August, and scored his first goal against Brentford on 30 September by tucking the ball home after his initial penalty was saved by David Button. On 24 October 2014 Watford terminated Ighalo’s loan, and re-signed him on a permanent deal the same day after Udinese released him from his contract. Exactly three months later, he scored four second half goals and was voted Man of the match in a 7–2 home routing of Blackpool, who led 0–2 at half time; he took his league tally to 14 on 10 February 2015, after netting a brace to help his team come from behind at Brentford to win it 2–1 – his second came through an injury time header. Ighalo scored in his Premier League debut on 8 August 2015, replacing José Manuel Jurado 16 minutes from time and putting the visitors ahead 2–1 in an eventual 2–2 draw away against Everton for the season opener. 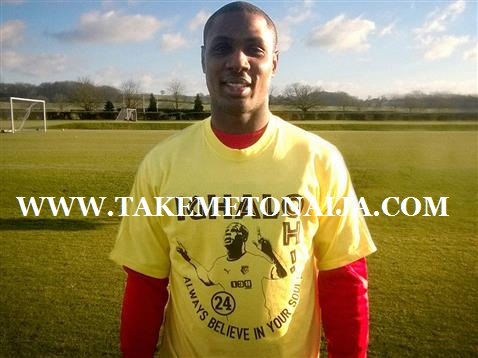 In March 2015, after a series of strong performances for Watford, newly appointed Nigeria coach Daniel Amokachi selected Ighalo for the first time, and the latter stated, “I feel good because it is my dream to play for my country”. He gained his first cap two days later, starting in a 0–1 friendly home loss to Uganda. Ighalo continued in his role as a starter for Super Eagles of Nigeria aside of Anthony Ujah and netted a first goal for his country against Chad during an Africa Cup Qualifier 2017 match. Odion is happily married with kids and does not talk about his family and relationship, he believes it is personal. He has promised to help people in Ajegunle where he grew up by opening a football academy to make it easy for the kids to have a career in football. However the star player has planned that whenever he finishes playing he would love to be a coach, He is planning to start a coaching course and keep himself busy and see how it goes, so to have something to do after football and he can hold-on to.